This article first appeared at American Lens News on March 14, 2017. Yesterday evening was the first State of the State address for North Carolina Governor Roy Cooper. There was little in the way of remarks on the actual state of the state. There was also little new material other than a brief touch on opioid abuse in the Governor’s address. The bulk of the address contained much of the same rhetoric and the same promises he campaigned on. The Governor repeated his plans for more education spending, teacher raises, ‘free’ community college and stipends for teachers to buy supplies, yet did not state in his address how these spending increases would be funded. American Lens has reached out to the Governor’s office on this topic before, however, no comment has been forthcoming. The Governor said that we need, “changes to our tax code need to focus on working families, not corporations and millionaires.” This statement is at odds with the current tax reforms put into place over the last three years. North Carolinians were paying between 6 and 7.5% in personal taxes. Governor McCrory and the legislature worked out a reform that set a flat rate of 5.8% in 2014 and that rate decreased to 5.499% in 2017. On the corporate tax side, North Carolina had one of the highest corporate rates in the Southeast prior to the reforms at 6.9% in 2014. That rate was brought down to 4%, which had the result of taking North Carolina from 44th to 11th in the nation in terms of business-friendly tax climates. The rate will drop again in 2017 to 3%. Near the beginning of the Governor’s State of the State remarks, he pressed again for repeal of HB2. “Our people are welcoming. But some of our laws are not,” said Cooper. “I’m going to say this first thing because of the urgency and to go ahead and get it out of the way. Tonight, I call on the legislature once again to repeal House Bill 2. The law has damaged our state. The legislature must erase this law from our books. Pass a clean repeal of HB2 and I will sign it the same day, ” Cooper said. To date, Democrats have had four chances to repeal or compromise on HB2 and have failed to follow through. On two occasions, one just this past December, Governor Cooper inserted himself into the issue and urged Democrats to vote against repeal. The Governor put out his own repeal proposal, which was quickly shot down by the Lt. Governor as being a ‘look but don’t touch’ policy. Read the Governor’s full State of the State remarks. 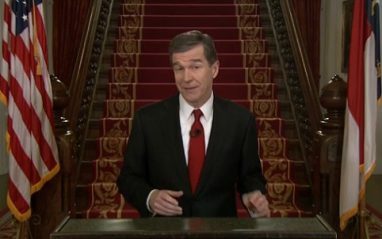 Watch Governor Cooper’s State of the State Address HERE. Senator Phil Berger delivered the Republican response HERE. This entry was posted in Am Lens, POLITICS NC, Roy Cooper and tagged Roy Cooper, State of the State Address. Bookmark the permalink.